The e-Bug project is led by Public Health England’s (PHE) Primary Care Unit in England and involves a consortium of 28 international partner countries. The main aim of the project is to educate children and young people across the globe, at junior and senior school level, about microbiology, hygiene and the spread, treatment and prevention of disease. e-Bug also aims to reinforce an awareness of the benefits of prudent antibiotic use and how inappropriate use can have an adverse effect on antibiotic resistance in the community. The areas of hand and respiratory hygiene and spread of infections in the community are also covered, including teaching how to wash hands most effectively. The e-Bug resources comprise of a teacher and student educational pack reinforcing an awareness of essential hygiene and antibiotic issues through detailed interactive lesson plans and an interactive website hosting complementary games, interactive quizzes, disease fact sheets and much more. Why teach school children about antibiotics? Antimicrobial resistance remains one of the key problems within community and hospital settings within Europe. In many European countries, antibiotic prescription rates are highest in children. Teaching children about the different types of microbes, the activity of antibiotics against them, and the increasing problems of antibiotic resistance with unnecessary use, should raise awareness of prudent antibiotic use in children who are our future generation of users. Within schools, infections are a major cause of absenteeism with poor respiratory and hand hygiene contributing to increased spread. School hygiene campaigns can reduce rates of infection in school children, staff and their families; this in turn may reduce antibiotic use. The e-Bug team is made up of dedicated, experienced and knowledgeable people from public health and education in each partner country. Each of these individuals are driven by the common aim of promoting key health and hygiene messages to their children and young people by implementing the e-Bug resources across their country. To find out more about the e-Bug partners click here. The e-Bug project was established in 2006 with 60% co-funding by DG SANCO (European Commission Directorate General for Health and Consumers) and was coordinated by the Public Health England’s Primary Care Unit, England. The initial e-Bug consortium consisted of 10 associated EU partner countries (316 million) covering 61% of the EU population with the highest antibiotic use and those with large populations, thus obtaining education amongst a high percentage of high antibiotic user countries. These include: France, England, Belgium, Spain, Poland, Czech Republic, Italy, Denmark, Portugal and Greece. 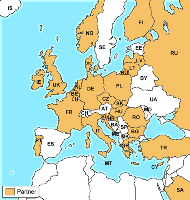 Collaborating countries (Croatia, Finland, Hungary, Latvia, Lithuania, Ireland, Slovakia, Slovenia) (37.5 million) cover a further 7% of the European population and have been involved in the development of the e-Bug resource. In total, this initiative will reach 68% of the European population. This consortium was led by the Public Health England (Project lead: Dr Cliodna McNulty, Project Manager: Dr Donna Lecky) with the teachers website and the 2 initial educational games developed by City ehealth Research Centre, City University (Website Manager and Games Research Lead: Dr Patty Kostkova, Website and Games Developer: Mr David Farrell).